Click on the Hosting tab and then select the hosting plan you want to log into the cPanel for. 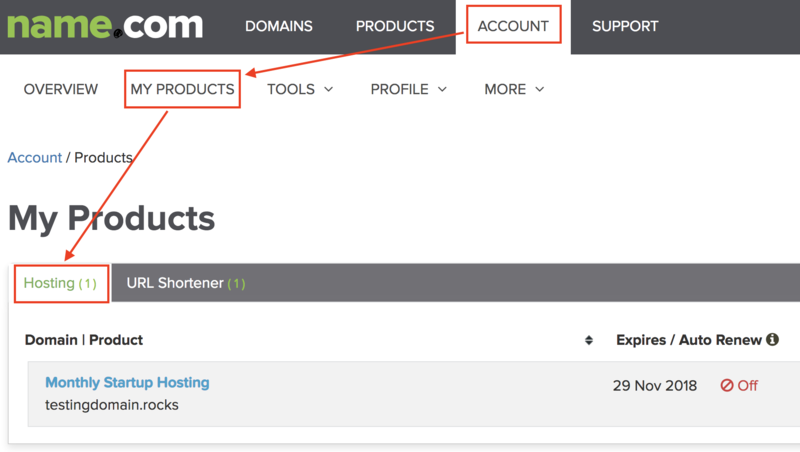 On the Web Hosting Dashboard page, click the cPanel Login button. This will log you into cPanel automatically. You can also login to the cPanel directly. Just type http://yourdomain.com/cpanel and log in with your cPanel username and password. You can find your username on the Web Hosting Dashboard page where you can also reset your cPanel password. Note: Your cPanel username and password may differ from your Name.com username and password combination. Still need hosting? Choose a plan. Whether you are a beginner or expert, Name.com provides the best web hosting plans to suit your individual needs.